I’ve ridden this trail before. However, I’ve only just ridden a portion of the loop. This is a shared use trail. The last time I rode it was around Presidents day 2013 and I discovered it purely by accident. 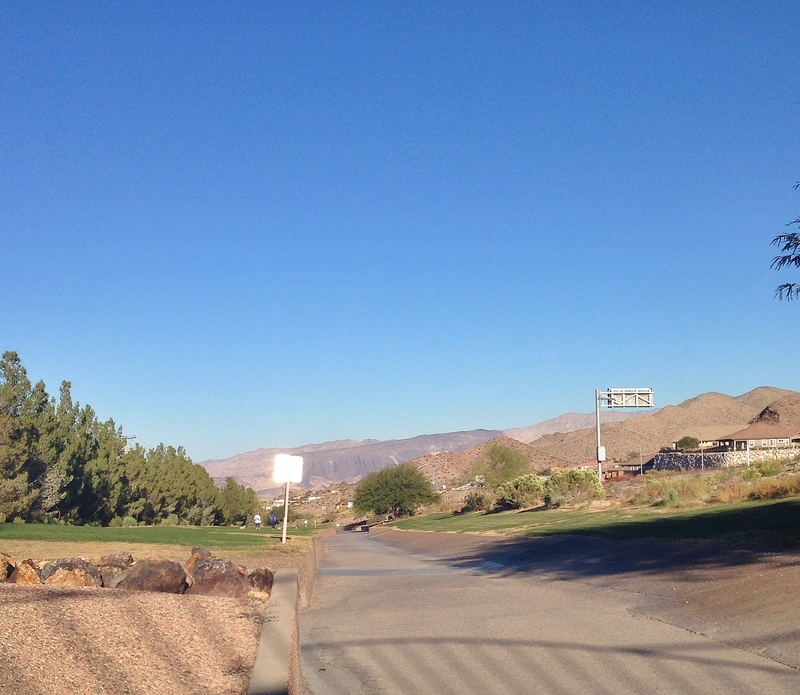 Back in Feb I made up my own route around the city of Henderson, NV and ended up on a portion of it. I was pleasantly surprised when I discovered it wound its way around (all the way around) the River Mountains. At that time I picked it up on the Southeast corner of Henderson, followed it to Lake Mead Pkwy (almost to the Three Kids Mine) then returned to my point of origin along Lake Mead Pkwy. I have a fond memory here of stopping on the trail to take a picture and being yelled at to GET OFF THE TRAIL TO TAKE YOUR DAMN PICTURE! “Damn” added for dramatic effect. The other cyclists sort of snuck up on me. I thought I was the only one out there. Since that time, the trail has been on my list to return to and complete. Even the portion that I did ride was super fun and I couldn’t wait to get back to it. I was on a return trip to AZ for the weekend by way of Las Vegas and so I opted to make it a point to stop and ride the entire loop. 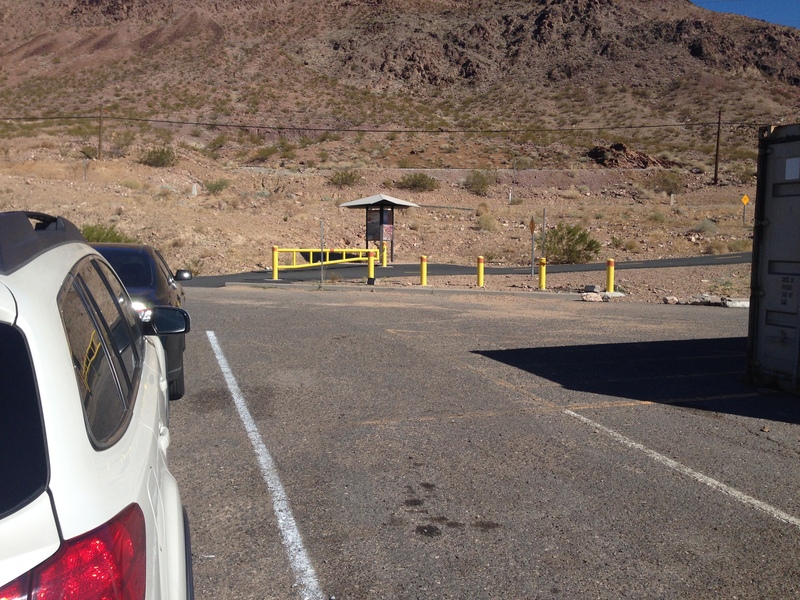 I arrived at noon and parked near the trail at Railroad Pass Casino. This is a good place to start because mile marker zero begins here. The trail markers count up milage in a clockwise direction. You have the option of going either direction and is paved the entire route of 35 miles. At the casino trailhead. Mile marker zero. Like I said, this is designated a shared trail so you will likely encounter walkers, runners, inline skaters, boarders, and even a horse or two (designated horse portion on the Northeasterly side). You will most certainly encounter horse excrement on the portion that horses are allowed but this can be easily avoided if you keep your eye out for it. Starting where I did at the casino, the trail follows a decent of rolling hills and a few short, sharp 15 degree climbs. 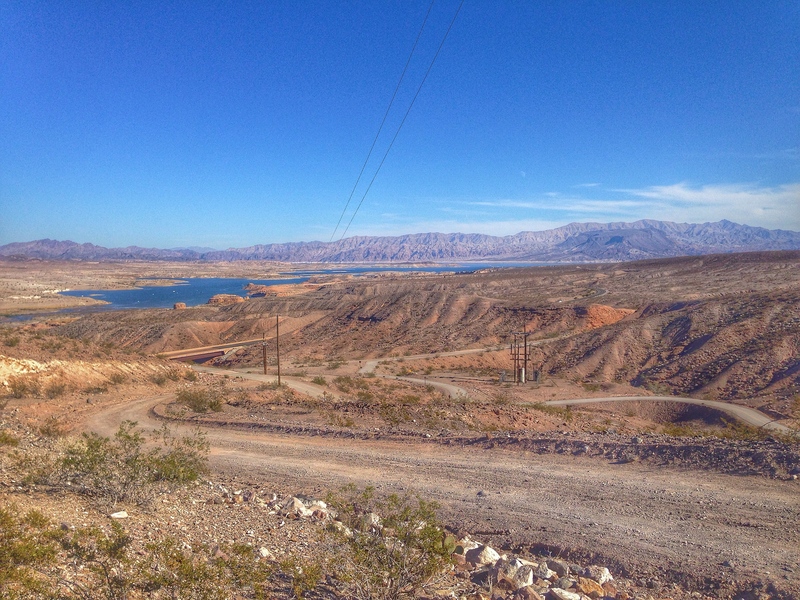 Mostly though, the trail descends gradually all the way to Lake Mead Marina. 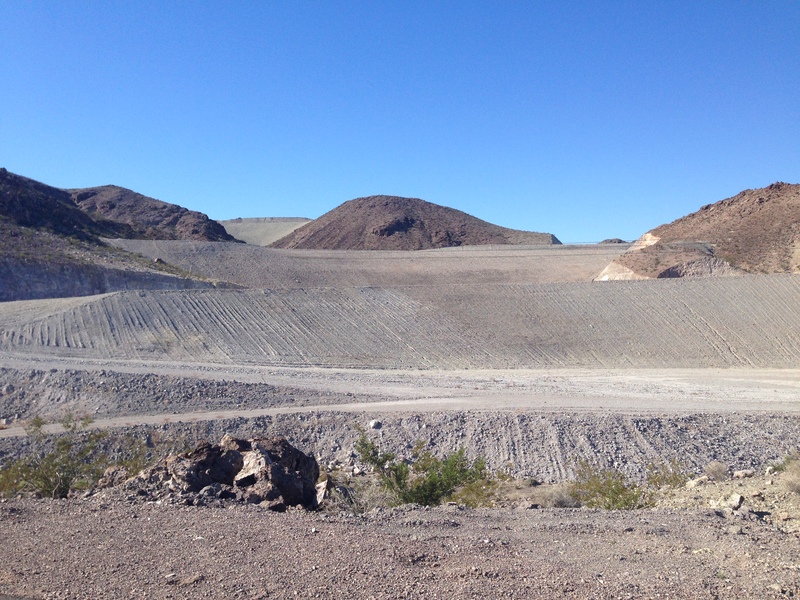 Perhaps the most isolated portion, this drops into Lake Mead recreation area. Don’t expect to coast all the way down. There are climbs. Be prepared to have the legs for it! The real climb begins after Lake Mead Marina. A gradual 7 mile climb paralleling the road to the marina then following the old railroad grade from the Alan Bible visitor center until you meet up again with State route 93. Here you bike up a drainage that doubles as the trail. 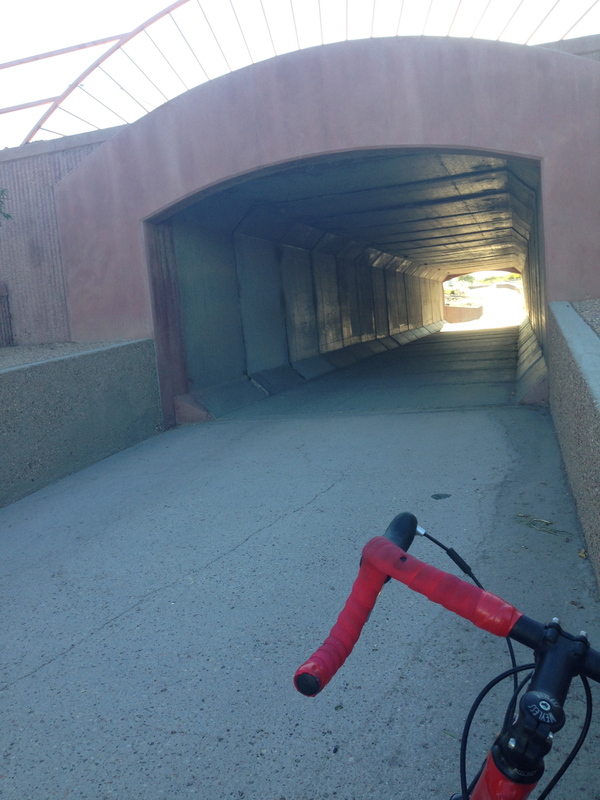 When riding parallel to route 93 you ride in this storm water drainage canal. Shared use again, with storm water! I’m sure steps would be taken to close this portion should such a storm threaten its use. 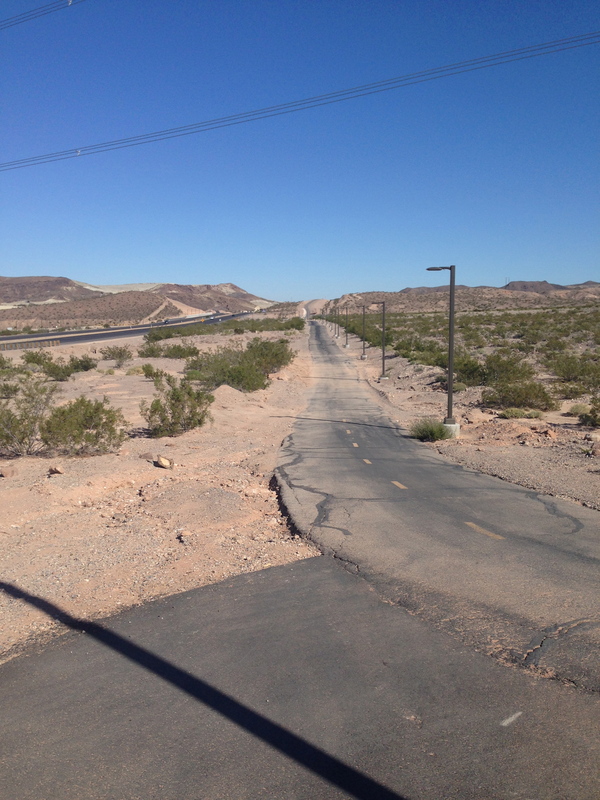 Once you get well into Boulder City the trail levels out (PRAISE JESUS!) and makes the final push back to the casino. Here the trail also passes at the base of Bootleg Canyon Park. There are many MTB trails here as well as those for hiking and even zip lines (if you want to use these you’ll need to contact the local outfitter for a guide). I still think it’s strange to find zip lines where there are no trees. Anyhow, I see that I’ll have to return again to bike the trails in Bootleg. Looks like mighty fun to be had. My mileage on the trail came to about 35 miles. The information around the trail tries to convince you it’s 31 (However, when that trail info was posted it was perhaps that milage. It’s finished know and is clearly longer). Climbing totaled around 2500 feet. 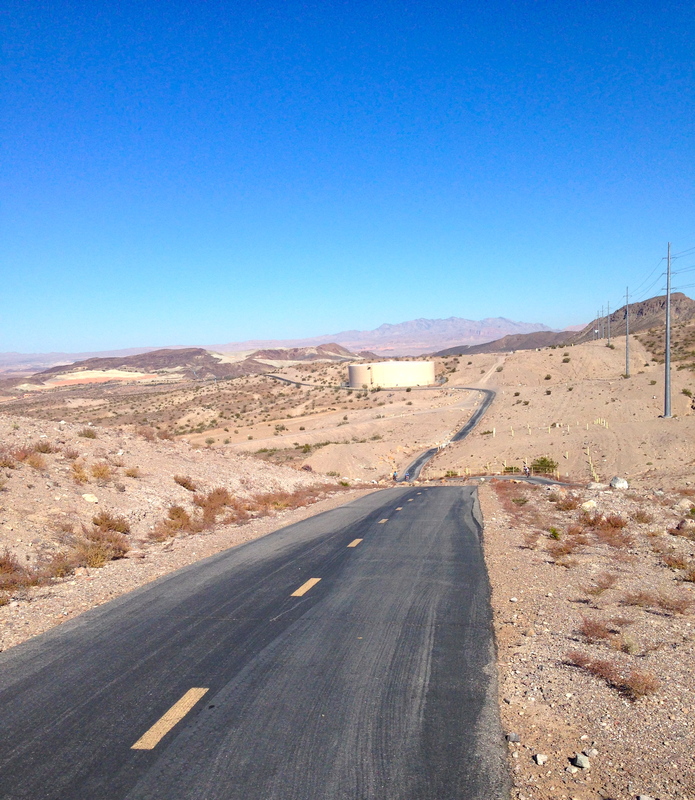 This trail is SUPER fun and well worth the ride but the climb out of Lake Mead seems to last forever. Be sure you have the legs and lungs for it and LOTS of water. It’s dry here. IT’S A DESERT FOR CRYING OUT LOUD! Overall, I’d have to say this is one of my favorite loops. Stunning desert scenery, stark isolation, well planned trails and best of all SUPER FUN. This is on the North side around the Three Kids Mine. This is on the east side and the sun was in the western hemisphere. This gave the mountains a very black foreboding look. 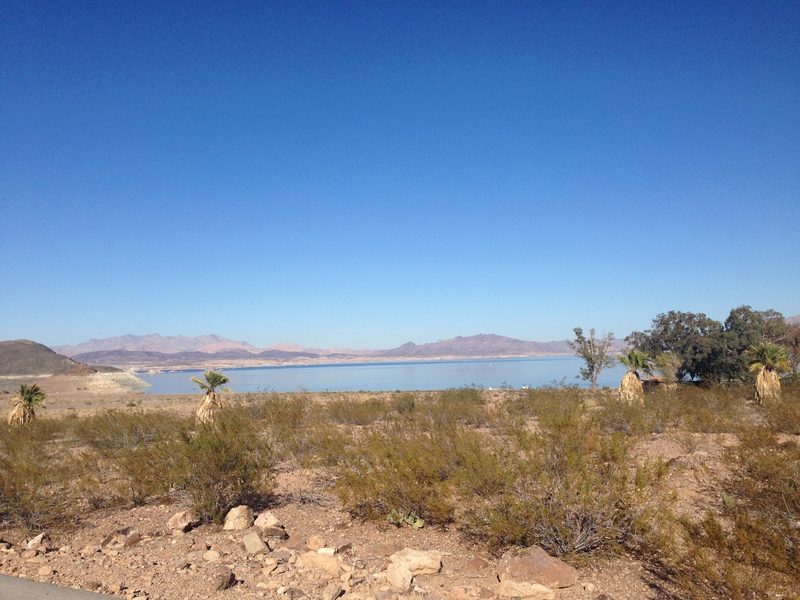 Looking at Lake Mead. Marina is just to the right. Wirepass. 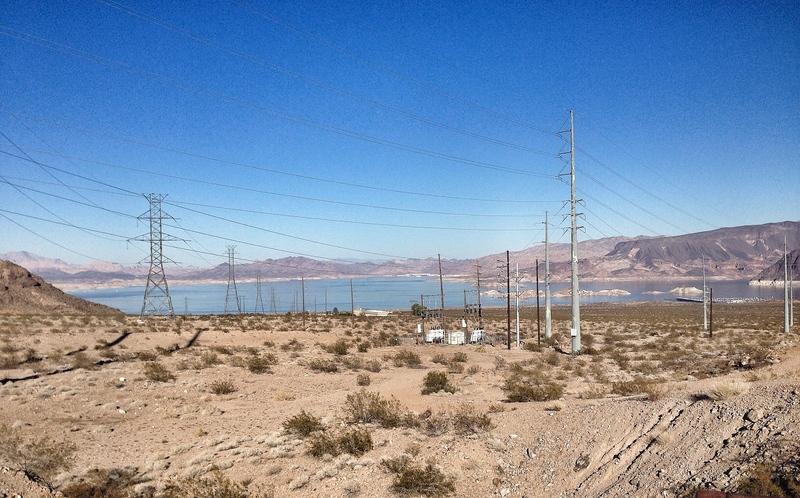 Electric supply running from Hoover dam. This portion is the climb out on the old railroad grade. Riding parallel to Lake Mead Pkwy. Pointing to the east. One of the steepest hills on the trail. So steep, you can’t even see it. 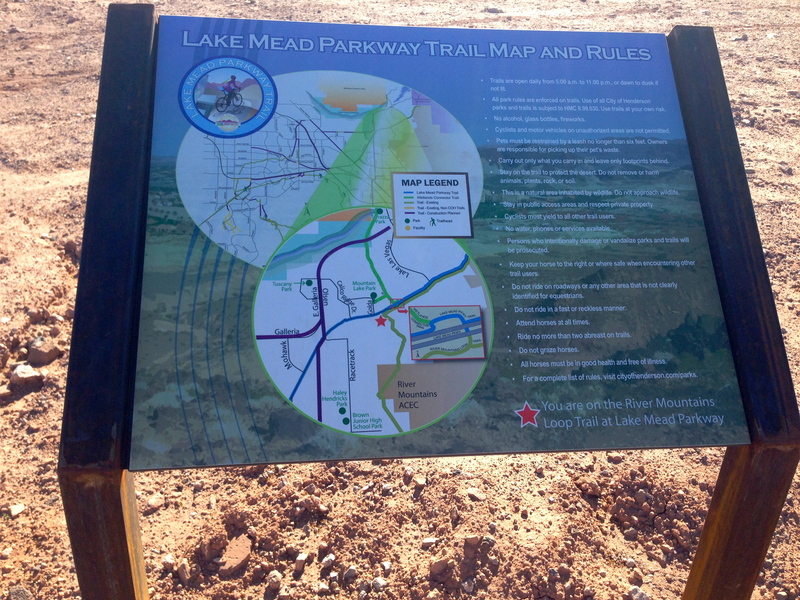 Trail info board. There are more like this but often with more interesting information like the landscape, history, old cultures that lived there and animal life. Last weekend was Presidents Day weekend. The long weekend demanded I get out and spin…and it had to be somewhere warm. I clocked in 68 miles. 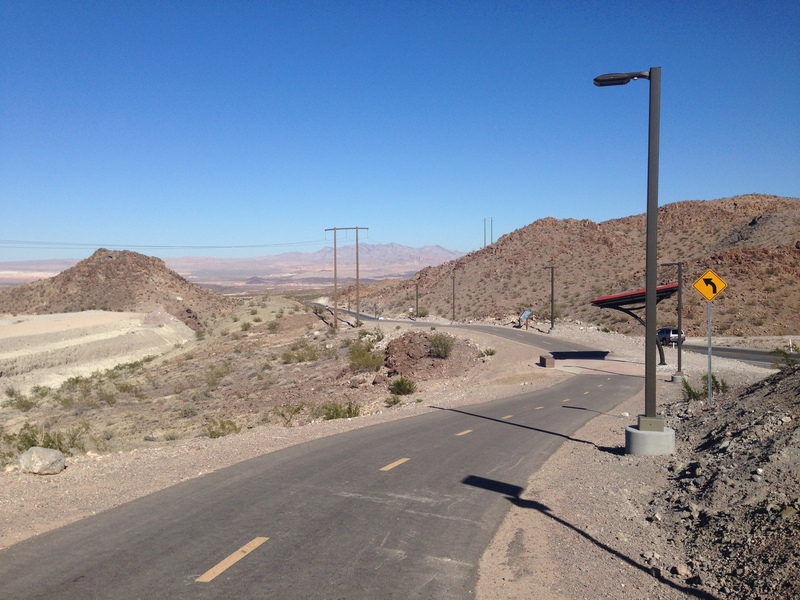 My first ride was Red Rock Canyon loop = 16 miles, then Henderson, NV loop=33 miles (super fun on path along those mountains with the big “B”), and finally the Zion NP road from the gate to the Temple of Sinawava. Haven’t had a good weekend like this in a long time. I may write a more detailed blog over in MTB50 Enjoy the pictures. The Call Of The Slots. Mud. My old friend. I missed you. …but not really.